Our herbal replenishing serum with argan, coconut, jojoba and Vitamin E oils will nourish your hair, and leave your strands soft, shiny and easy to manage. Great for twist outs, blow drying, curling, roller setting, hot oil treatments, and as an overnight deep conditioner. Our light non-greasy formula also helps to seal in moisture leaving dry skin soft, smooth and healthy, naturally. For Hair: Apply a dime sized amount of oil to natural or chemically treated hair to help smooth the stands and lock in moisture. To use as a hot oil treatment, warm oil in microwave for thirty seconds. Allow to cool for one minute. Apply oil to wet hair and cover with a shower cap for twenty-five minutes. Rinse out and condition as usual. For Skin: Smooth onto hands, face, legs and feet as needed. Ingredients: Coconut Oil, Olive Oil, Argan Oil, Peach Kernel Oil, Jojoba Oil, Vitamin E, Hibiscus Flowers, Fragrance. You know that one thing you have to order by the boatload because you use it for everything? Yeah, this serum is that product in our household. We use this oil for EVERYTHING! I like to use it as a hot oil treatment because it has argan oil in it and if you don’t know argan oil really is great for hair. It makes it strong and healthy. My kids and husband use this serum for their skin (ashy heels and elbows, especially). You only need use a little bit to get the desired effect on hair or skin. Seriously AMAZING! I don’t know what it is about this oil but it really stops my hair from frizzing up. Simply amazing! 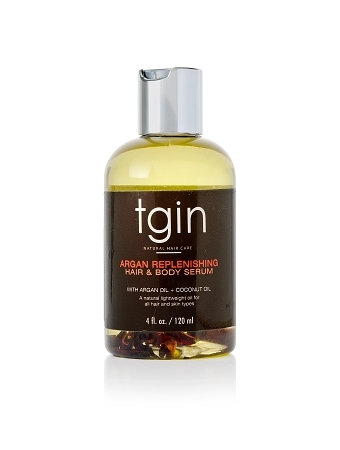 I use this serum on my hair after any style as a way to lock moisture in. I really love using it as a sealant especially after twisting my hair. My hair feels healthy and looks so shiny. I also like to use it to make my hair look healthy and alive after a twistout. Great smell. Perfect size. Very light! I love this stuff! This serum is the best oil for locks! It sinks right in without making my hair feel greasy. It is so light!